This is an award winning culinary break that we highly recommend. This Culinary Escape will take you to elegant and luxury surroundings, Tankardstown comprises an impressive 18th Century Manor House & Orangery; a central courtyard of Cottage Suites; adjacent to the Garden Village where classic dining takes place in Brabazon Restaurant or ‘The Cellar’ offers more casual fare and afternoon tea. A truly special place to stay…. Stop for a moment, gather your thoughts, I need rest, relaxation and revival. Exuding Luxury and Elegance Tankardstown is the ideal escape for a midweek break. Leaf through a book, or simply be and enjoy the surroundings. Created by Head Chef Rob Krawczyk and his team in Brabazon Restaurant, a feast for the eyes and the palate. Sleep soundly with only birdsong and trickling fountains to disturb, and awaken to the peace and quiet of the Boyne Valley. A hearty Breakfast will set you up for the day ahead. We highly recommend Tankardstown for it’s stunning property, grounds and food. 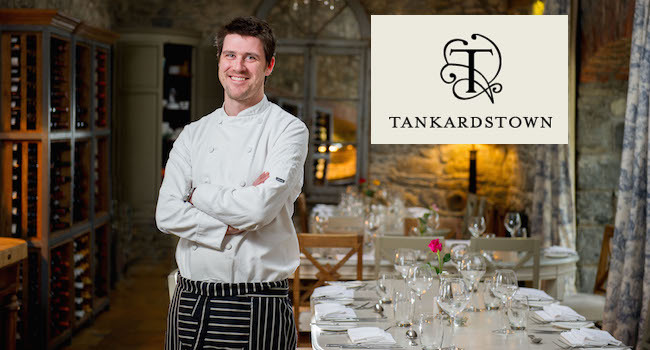 Tankardstown have recently scooped a trio of RAI Awards in the Leinster Final, they won Best Chef, Best Hotel Restaurant and Best Wine Experience. Georgina Campbell Atmospheric Restaurant of the Year 2015. National Hospitality Awards, Best Boutique Hotel 2014. Restaurants Association of Ireland, Best Hotel Restaurant in Meath 2014. Restaurants Association of Ireland Best Chef in Meath 2014. Gold Medal Award Finalist in Best Fine Dining Restaurant 2014. – Available: Wednesdays/Thursdays and Sundays. – May not be used in conjunction with any other offers. – Accommodation is for Courtyard Cottage Rooms. – Available until 30 June 2016.